Start with any piece of crochet work, which you want to join a new yarn onto. 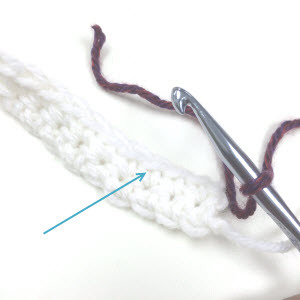 I am using a small swatch of single crochet stitches, as shown below, for the purpose of this tutorial. With a different color of yarn, begin with a slip knot on your hook. The photo below shows this done. 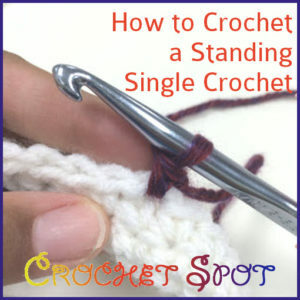 The arrow is pointing to the stitch where I am going to place the standing single crochet. 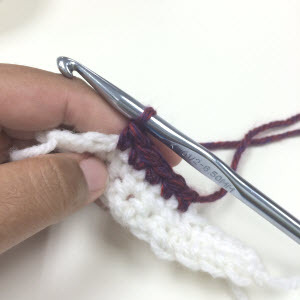 Single crochet into the desired stitch, where you want the new yarn to start. The photos below shows this in progress. Here I have inserted the hook into the desired stitch. Here I have pulled up a loop. Standing single crochet is complete after yarning over and pulling through. 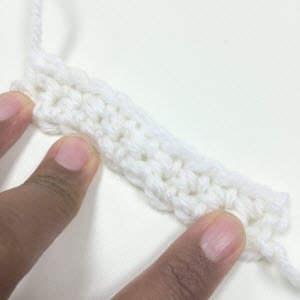 It should look like an ordinary single crochet stitch when complete. Feel free to continue working across the row with more single crochet stitches, or continuing on with a desired stitch pattern. 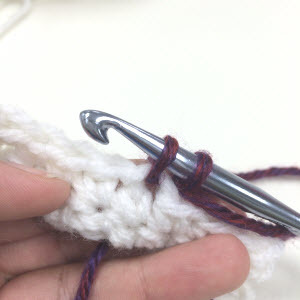 One of the cool things about standing single crochet is that you can join yarn literally anywhere in your work where you can insert your hook. This is a useful technique in shaping and colorwork. This entry was posted on Tuesday, August 2nd, 2016 at 12:00 AM by Caissa "Cami" McClinton	and is filed under Tutorials and Help. You can follow any responses to this entry through the RSS 2.0 feed. You can skip to the end and leave a response. Pinging is currently not allowed. 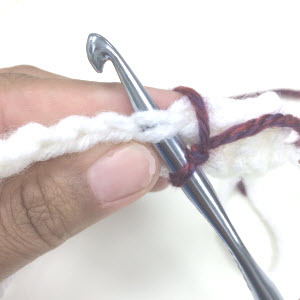 Thank you for sharing this simple but ingenious method for joining new yarn. It’s one of my least favorite parts of crocheting. The other? Why tidying up loose ends. Do you have a clever method for weaving in loose ends? I’d love to see it! Thank you very much for sharing. This looks so easy. No more loose ends to complete. I always hated joining with a different color. Now this will be so simple. That will certainly make my joining to a new color much neater, thank you! As above comment says weaving in loose ends would be a good one too. Thank you for sharing this. 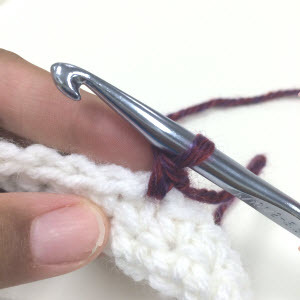 I’ll be using this technique for crocheting a coverlet using 5 strands, single crochet, all rows right side, no turning. This will help! i don’t understand how this helps. don’t you still have the old color and the new color ends to weave in?